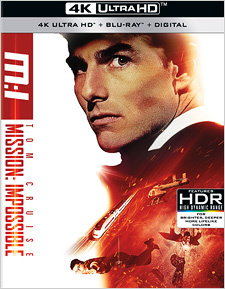 Based on the classic Desilu/CBS TV series of the same name from the late 60s and early 70s, Brian De Palma’s big screen Mission: Impossible stars Tom Cruise and Jon Voight as Ethan Hunt and Jim Phelps, the leaders of a squad of American Impossible Missions Force agents operating deep undercover in Eastern Europe. They’re tasked with recovering half of a stolen CIA “non-official cover” (or NOC) list of agents, which is being offered for sale in the criminal underworld, and preventing the other half from being stolen too. But when their mission goes bad, and nearly the entire team is killed, Hunt becomes the target of IMF suspicion. They think he’s the mole who leaked the list in the first place. Now Hunt must find what allies he can from among a rogue’s gallery of “disavowed” former IMF agents to identify the real mole and clear his name. I’d honestly forgotten how good this film is... and how restrained the editorial pacing is in much of the first half. It’s very old-school. Even for a film produced in 1996, there’s a strong 1970s feel that’s clearly meant to hint at the film’s TV origins. But once the action moves from Prague to Langley, Virginia, it picks up significantly. And by the time we get to the film’s climax, on a bullet train through the Chunnel, the pace is modern and relentless. I’d also forgotten somehow that this film featured the talents of Kristen Scott Thomas, Vanessa Redgrave, Emmanuelle Béart, Emilio Estevez, Dale Dye, and Jean Reno in front of the camera, in addition Cruise, Voight, and Ving Rhames (who is the only other character to appear in all of these films with Cruise). Now that is an interesting ensemble cast. Mission: Impossible was shot on 35mm photochemical film using Panavision Panaflex cameras and anamorphic lenses. It was finished on film, scanned for this release in full native 4K (presumably from the original camera negative), graded for high dynamic range in both HDR10 and Dolby Vision, and it’s presented here on Ultra HD at the proper 2.39:1 theatrical aspect ratio. The image exhibits a major increase in fine detail, texturing, and basic cleanliness over the previous HD presentation on Blu-ray, which was plagued by digital noise and was oddly rife with visible dirt, dust, and other print artifacts. Granularity on the 4K image is moderate throughout, but also appropriate and entirely consistent with the vintage and nature of this production. The image benefits strongly from the HDR and wider color gamut, with deeper blacks, brighter highlights, and significantly more refined, vibrant, and accurate coloring than the Blu-ray. The one knock against the 4K image quality is that the visual effects shots were obviously rendered at a lower resolution (sub-2K), then scanned back out to interpositive film. So image does occasionally get softer and less detailed looking, including during the film’s memorable high speed train sequence. A couple of shots are also optically soft, and there’s occasional anamorphic softness around the edges of the frame as well. But all that’s to be expected, and it’s not a defect; it’s just the nature of what this film is and when it was made. The important thing is that fans familiar with the previous Blu-ray and DVD should be very pleased with this image. Primary audio on the 4K disc is available in a new 48 kHz/24 bit English 5.1 Dolby TrueHD lossless mix that’s a significant upgrade from the previous Blu-ray’s lossy 5.1 Dolby Digital offering. The soundstage is big, wide, and full-sounding, with a solid foundation of low end and nice surround play and atmospherics. Dialogue is clean and crisp, and the Danny Elfman score (with its iconic Lalo Schifrin theme) sounds terrific. The mix is a little tighter in its directionality that a modern object-based mix would be, but it’s still a nice improvement over the BD mix. Additional audio options on the 4K disc include English Audio Description, 5.1 Dolby Digital in German, Spanish, Latin Spanish, French, Italian, and Japanese, and Dolby Digital mono in Brazilian Portuguese. Optional subtitles include English, English for the Hearing Impaired, Danish, German, Spanish, Latin Spanish, French, Italian, Japanese, Dutch, Norwegian, Brazilian Portuguese, Finnish, and Swedish. It’s decent content, and worth looking at if you’re a fan. But those of you who are fans have likely seen it all already. You also get a Digital Copy code on a paper insert in the case, which comes in its own cardboard slipcover. Written smartly and well-directed, Brian De Palma’s original Mission: Impossible marked a very solid start to what has since become a surprisingly great action-spy film franchise. Paramount’s new 4K presentation is by far the best this film has ever looked before, at home or in theaters, and is a major step up from both the 2008 Blu-ray and original 1998 DVD releases in both picture and sound quality. It’s definitely recommended for fans and casual Ultra HD viewers alike.